It is not a secret around here that this mascara makes my heart beat faster. If you have reviewed this product on your blog, I have probably commented on your post saying how much I love it and how I cannot get enough of it. No review of it has yet been done on this blog (apart from a small mention of it here), but considering how many have shared their thoughts on this mascara out there, I thought it would be much more interesting comparing the normal formula with the new waterproof version. Apart from the obvious fact that one is waterproof and the other isn't, the packaging is similar, the wand is identical and the formula smells the same. Yes, I smell mascara…don’t you?! Both also claim to give the same results: “Reveal the look of Layers & Layers of Sensational lashes. Brush captures even the tiniest lashes and volumizes the look of longer lashes for a layered, multiplied lash look." I already knew the original formula lived up to the product description. Simply put, the Maybelline Lash Sensational Mascara is wow! The brush works extremely well (no wonders lots of other brands are now coming out with their own version of this), the formula doesn't clump or need multiple coats. Application is smooth and the result is long individual lashes with crazy volume that do not flake throughout the day. It boasts that it is a multiplying lash product and rightfully so. From the first coat you can already see a massive difference, but I usually apply a second one for a more dramatic effect. Removal couldn't be easier, it simply melts away from your lashes with water and a tad of make-up remover. This is by far my favourite drugstore mascara of all time and I am already on my third tube! Similar to its non-waterproof counterpart, the Maybelline Lash Sensational Waterproof Mascara delivers clearly defined lashes with a beautiful fanned out volumized effect. The brush is identical and it works by depositing mascara at the root of lashes and thus multiplying them. Its formula also does not clump, flake or smudge and one or two coats are all you will need. The only thing to point out is, as with most Maybelline mascaras, they are not messing around when they say waterproof! Taking it off lead to some lashes to fall out and a really good remover is necessary or else this stuff will not be coming off. If you plan on wearing mascara to the beach (which I always do) or on a hot summer’s day, this comes in handy as it will not budge! I found it hard to remove it completely and that is the only thing that I didn't like about it. ♥ Well-defined, volumized lashes with one/two coats. ♥ Well-designed wand that produces long individual lashes. ♥ No clumping, flaking and smudging. ♥ Smooth application and long wear. ♥ Easy removal (original formula). ♥ True waterproof wear (waterproof formula). ✗ Difficult removal (waterproof formula). ✗ Difficult application on bottom lashes. Left: Original/ Right: Waterproof . Two coats of both. All in all, we would have to agree with their names. These really are sensational mascaras! If you haven’t yet tried these I recommend them 100%. At the price of £7.99 you don’t wanna miss out (oh and they are both on sale at the moment in Boots for £5.99). Have you tried any yet? Let me know below! Thank you for reading and all the love on my previous post! Though I haven't tried this one yet, I'm sure it's on my list when I shop for a new one. Being a waterproof is not a con for me, I actually like waterproof mascaras cos if not, I always mess up hihi.. Thanks for sharing your thoughts about it, Pam! I hear about this so much but I've still never tried it! When my mascara runs out I'm definitely getting this! I need to buy the waterproof mascara, you are so beautiful!! I just bought the original one and I love it! Also your eyelashes are amazing! I love Maybelline mascara! I defo need to try this out and your eyes lool stunning hun! That has defo win me over! Heard so much about this going to have to give it ago!! <3 looks amazing! I never tried Maybelline mascaras, because I am faithful to a mascara I like, for years! But after your review and the photos (and you look beautiful! ), I sooo much want these mascaras! I guess they are amazing, and the result is incredible! I'm following you on blogger and facebook page. I hope you visit my blog!! Wow, how it's possible that I have never heard about this mascara? Thank you for sharing your thoughts about this, can't wait to try! I never heard about this mascara, so I'm super curious!!! I love your blog, so I'm following! 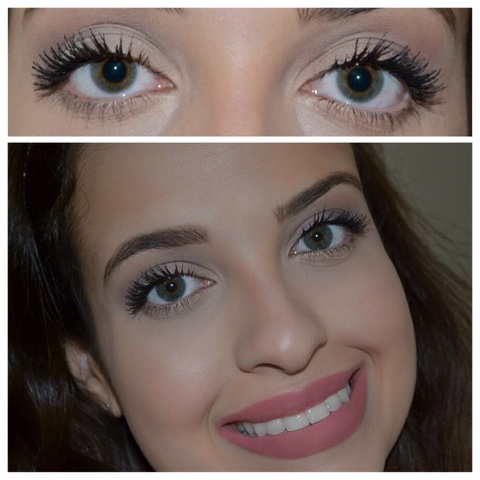 I'm always looking for good mascara- your lashes look so defined and long! Makes your lashes so much longer I have one of my own and it´s the best mascara I´ve gotten. I´ve been raving about this mascara for so long but it´s defenitely worth it! I wanna try and i am so jealous! I haven't tried this mascara yet but haven't seen a bad word written about it. I'm much more of a bristle rather than plastic brush girl but as it's on sale I might have to pick it up! Wow, your eyelashes are sooo long! I have been obsessed with this mascara all summer long. I still can't get over how well it works for being so inexpensive! I have yet to see the waterproof one here yet, but I definitely want to pick one up! I'm running a giveaway on my blog and it would be awesome if you entered, click here ! You really love this mascara :) it's not my favourite but I do like it! I have the waterproof version but I find it gets a bit messy at the tip of the tube! Love these styles of wands though! I love this mascara, I have only tried the waterproof Maybelline Lash Sensational which I love! It's a waterproof mascara that actually works, I sometimes have trouble removing it! you look gorgeous! <3 and I recently purchased the waterproof version of it! great review ^_^ hehe I guess the pros outweighs the cons :D <3 thank you for always dropping by my blog! I love this mascara, I really do, but holy crap, it doesn't look nearly as good on me as it does on you!!! I need the waterproof formula right now. Oh I need one of those mascaras this Autumn! I love the final result! Your eyelashes look amazing. Definitely going to try this out. I love the effect of it! The lashes look incredible! I really want to have the waterproof formula here in Portugal because in the summer I think it worth it! Havent tried this one yet but I'll probably pick up the waterproof version next time I'm at the drugstore, and use coconut oil to remove the mascara at night. Too bad they are not available here yet, maybe soon. I've been on the hunt for a new mascara, thanks for the recommendation!! Great photos, and wow your eyelashes look amazing. I will have to try these. Great review! I love the effect this mascara gives! Now I am tempted to give this one a shot. Although L'oreal's Miss Manga is my holy grail, but it looks so gorgeous on you Pam, I just need to get my hands on it. I love this mascara too definitely adds volume, but I prefer non waterproof mascaras because I have a hard time removing it. I use the maybelline volum express big eyes mascara and I love it, because it has two wands one for upper lashes and another for the lower lashes, and it makes my lashes look gorgeous. Makes me want to test out the mascara. Great review! I am terrible for panda eyes so I think I'll avoid the waterproof version, but I have to agree it really is a sensational mascara! This looks so amazing!! I love Maybelline's mascaras, but I have yet to try this one. I'll definitely have to pick one up soon! Great review, thanks for sharing! I think I`m the only blogger that hasn`t tried this, but after this, I might soon. I don`t know why, but I`m not a big fan of Maybelline, I usually prefer Rimmel or Bourjois. Except their colour tattoos and brow pencils which I love I haven`t tried much from them. Love the lashes :) Bisous from France, Sand. Amazing,and love the quality of your photos,xoxo. It is on my list to try when I run out of my current mascara. It sounds like I would love everything about it! Mascaras are also my make-up essentials, sounds really good, but it's rather not for me due to contents of parabens. Ok I'm definitely picking this up this week it looks amazing on you! Wow the mascara looks super good on you, you are very pretty! These mascaras always sound amazing! Looks great too. This mascara is stunning! It's long-lasting formula will be perfect for weddings or birthdays. Here's hoping it will finally be available in SA. I absolutely adore this mascara I have both the waterproof and the non waterproof formula and I just saw today that there is extra black version of this one, definitely going to get that too, you can never have enough mascara's isn't it! Well ... I've read all the amazing reviews on this mascara before I bought it online. Notice my holy grail is The Colossal Volume Express (waterproof because it holds the curve better), so this new one seemed a great choice. BUT when I first put it on... I hated it. I'm I doing something wrong? It got so much product on to my lashes, it seemed soooooo clumpy and all the little lashes were stuck together, and the curl I made with the lash curler went completely flat. I try to clean it a little bit (the excess on the brush) ... try to wiggle the wand ... nothing. Are the new ones all like this?? Help! I want to like this mascara so bad! These both sound awesome. I love the idea of waterproof but like you said, I don't like that it's harder to remove! So it's a bit of a double-edged sword.